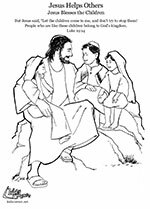 Did you know that Jesus loves children? Let's meet a family who brought their children to see Jesus. In a small house in a small town in Galilee, a Jewish family was eating dinner together. I heard some interesting news today. The Teacher, the Man they call Jesus, is traveling through this area, not far from here. Oh, I have heard so many stories about Him. He healed a blind beggar man and a man who could not walk. He even raised a little girl from the dead. Yes, I have heard these stories too. But, I have also heard that He is a teacher and tells stories about the kingdom of God. I would love to hear Him talk. So would I. Should we go to see tomorrow? We can walk and take some food with us. Actually, I was hoping that we could bring our children with and that Jesus would bless them? That is a wonderful idea. Let's do it. Let's take our children and go to see Jesus tomorrow. We will listen to His stories and watch as He heals people. We will also ask Jesus to bless our children and ask God to look upon our children with kindness. The next day the family packed up and set out to meet Jesus. Oh my, it looks like we are not the only ones from our village going to see Jesus. Yes, half of our village seems to be walking with us. I see you've brought all of your children. We also have our children with us so that they may be blessed by Jesus. I can see Jesus up ahead. I cannot believe how excited I am. Oh, children, can you see Jesus? Oh, excuse me, you are one of Jesus' disciples, aren't you? Yes, I'm helping Jesus. Jesus is here to preach about the kingdom of God. Wait, where are you going with all of those children? Why did you bring babies out here? We have brought our children with us so that we may ask Jesus to place His hands on them. We want Jesus to ask God to watch out for them. No, our Master has so much work to do. So many people are coming, asking things of Him. We need to protect Him so that he does not wear Himself out. Our master Jesus has no time for babies. Take these children home. Now, go! Please, we have come all this way for our children's sake. We only want Jesus to bless them. Please do not turn us away. He has no time for little ones. Take your children home. Let all of the little children come to Me. Don't keep them away. God's kingdom belongs to people like them. Anyone who will not receive God's kingdom like a little child will never enter it. Jesus took the time to touch every single baby and child that had been brought to him. He blessed all of the children by telling them of the great love God has for them. If you want to read more about the blessings Jesus brings to us, read the book of Matthew in the New Testament part of your Bible.